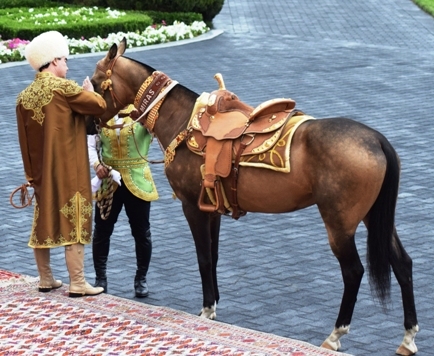 Ashgabat, 25 April 2016 (nCa) — Turkmenistan spent nearly a week eulogizing and celebrating its Ahal-Teke horse, the earliest known breed of horse in the world. 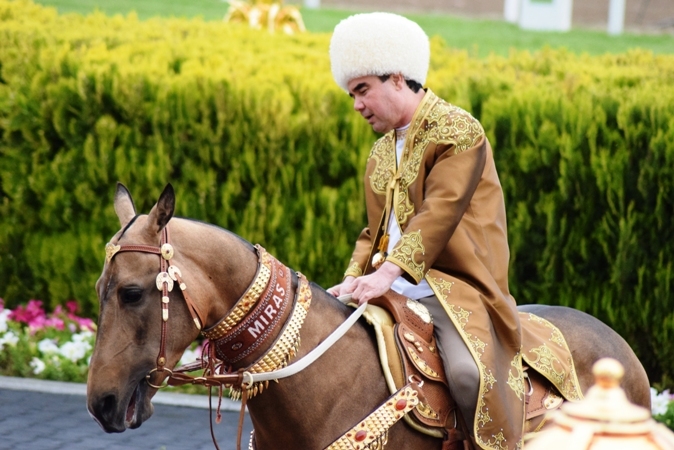 An international conference on the Ahal-Teke horse and the annual session of the international Ahal-Teke horse association was held on 20 April 2016. The races including those with teen and pre-teen riders took place on 21 April. 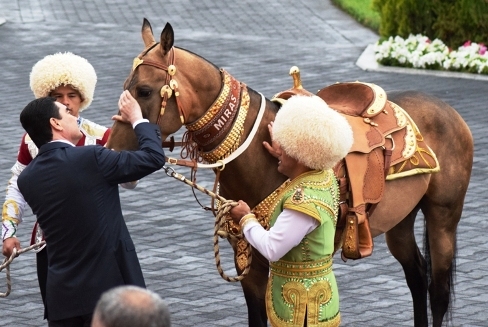 On 22 April, a breeding complex and a residential town for the employees of the equestrian sector was opened. 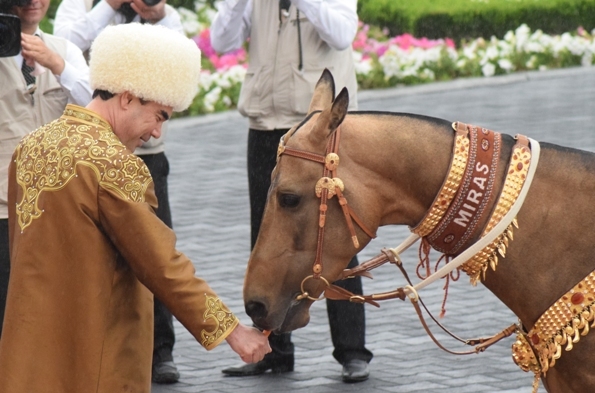 It is named after Aba Annaev, a cousin of the grandfather of President Berdymuhamedov and an accomplished breeder and specialist on horses. 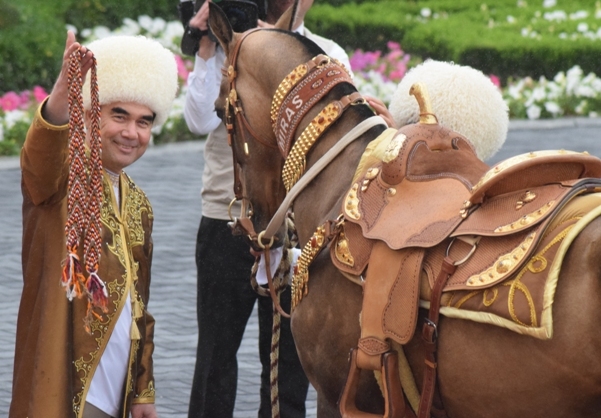 A colourful and majestic ceremony was held on 23 April where President Berdymuhamedov demonstrated exquisite riding skills and a wedding took place in the traditional set up. On the last day, which was also the annual Horse Day (last Sunday of April, 24 April), the main races took place where the top three prizes in each race were new automobiles. 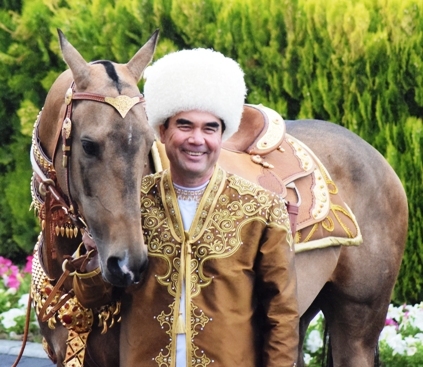 To understand why Turkmenistan pays such great attention to its horse, one needs to look at the role Ahal-Teke has played in the history of the Turkmen people and, in fact, the world history. 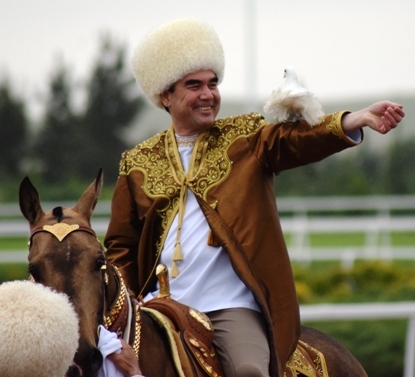 The proverbs are a good way to trace the roots of relationship between the Turkmen and the horse. 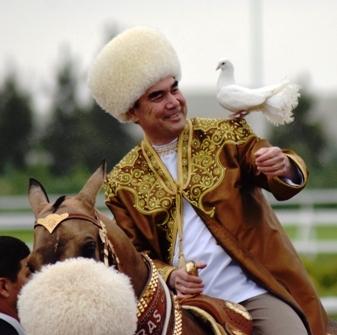 “Water is our life, horse is our wings, and carpet is our soul,” says a Turkmen proverb. 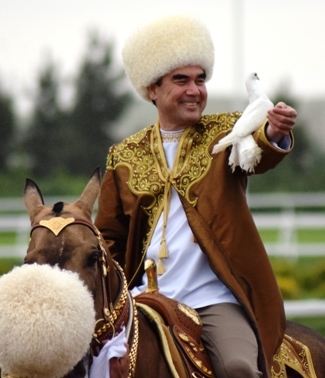 Some key war and peace events in the world history are pinned to the Ahal-Teke horse. Known variously as the heavenly horse, the fabled stead and the equine aristocrat, the Ahal-Teke is traceable to at least 10th century BC in the recorded history, as shown in a Cuneiform text found in Assyria. Herodotus describes ten sacred horses for the chariot of Ahurmazda in the Xerxes. 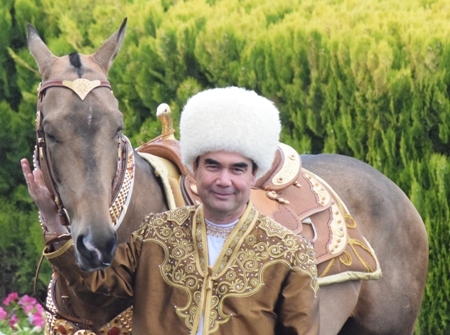 He says that the horses were bred in Nisei (Nisa, near Ashgabat). By description and placement, they were Ahal-Teke. The manmade Pazyryk hill in Altai (Siberia) was the burial place of a Scythian chief. It dates back to sixth century BC. The skeletons of horses discovered at the site are those of Ahal-Teke. The Persian king Cyrus the Great married the daughter of King of Medes to gain access to Ahal-Teke horse because he could not do so by force. Alexander the Great, through his marriage to Roxane, the daughter of a Bactrian king, acquired Ahal-Teke horses. His favourite Ahal-Teke and his trusted companion in many battles died while he was in the territory that is in the current-day Pakistan. A monument still exists there. The Chinese emperor Wu started a war in 1030 BC to get the Ahal-Teke horses. The Roman emperor Probe had an Ahal-Teke horse that could cover about 150 kilometers in a day, for up to ten days in a row. Genghis Khan had fast-moving battalions of his vast army mounted on Ahal-Teke. Amir-Timur (Tamerlane) whose entire army consisted of mounted soldiers – he did not have an infantry – had elite units that rode Ahal-Teke. 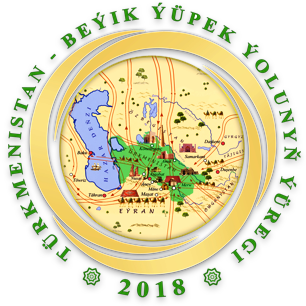 During the time of Alp Arslan, the great Seljuk king, an Ahal-Teke brought its seriously wounded and unconscious rider back to the base, traveling some 200 km. That was how the main army came to know that their reconnaissance party had been ambushed and annihilated. In the earthquake of 1948, that devastated nearly the whole of Ashgabat, there are numerous tales of a horse pulling the survivors from under the rubble. The unique features of Ahal-Teke are its ability to endure extraordinary heat and hunger, and its ability to travel long distances for several days. It is also highly intelligent, sensitive and loyal. 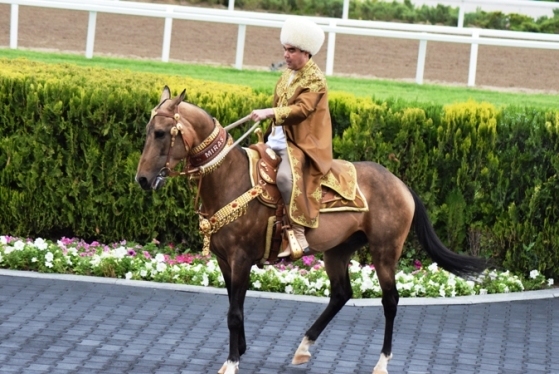 In 1935, Ahal-Teke horses covered a distance of 4300 km in 84 days (Ashgabat to Moscow). This included 360 km of harsh desert with virtually no water. This is considered a world record for endurance and speed. In 1945, a 500 km endurance race in Moscow was won by an Ahal-Teke. 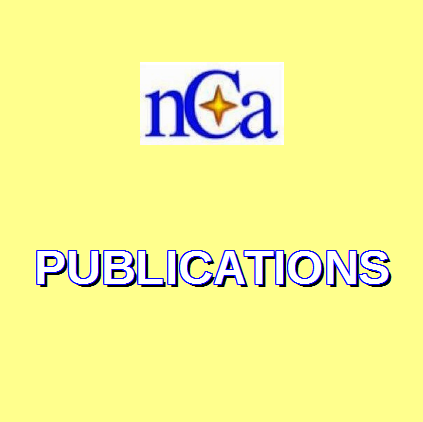 Eight breeds took part in this competition. 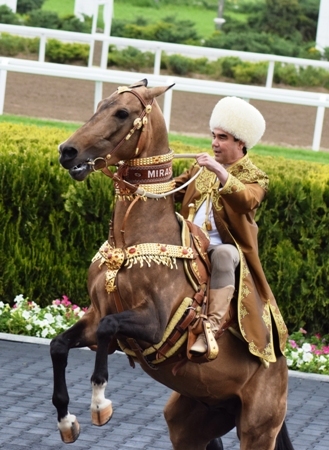 In addition to Turkmenistan, several countries have issued postage stamps dedicated to the Ahal-Teke horse including Azerbaijan (1993 and 1997), Kazakhstan (2002), and USSR (1968). 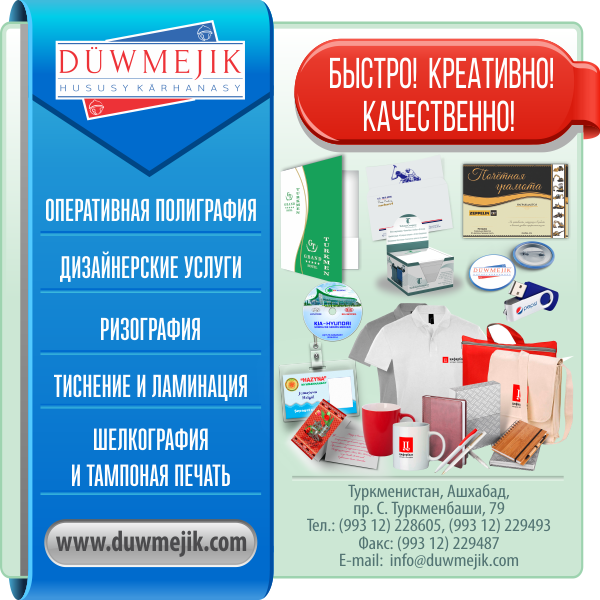 The defining qualities of Ahal-Teke i.e. 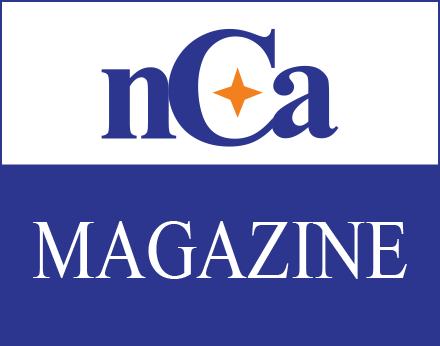 ability to bear hardship, dedication to task for long stretches of time, discipline, intelligence, and loyalty are the same that are required to build a unified, successful and prosperous nation. This is where we find the explanation of why it is so important to celebrate the Ahal-Teke horse. 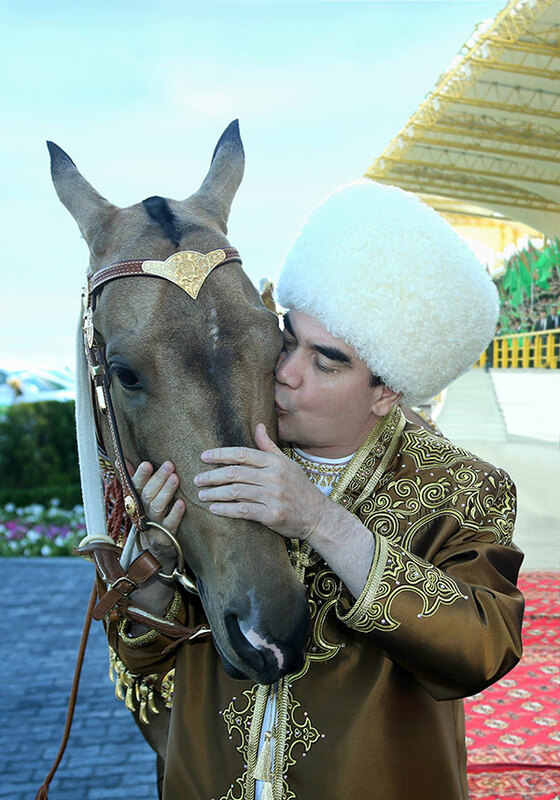 The love of the horse is ingrained in the Turkmen people and by building on that love, it is possible to build the nation that can face all the challenges with courage and pride. 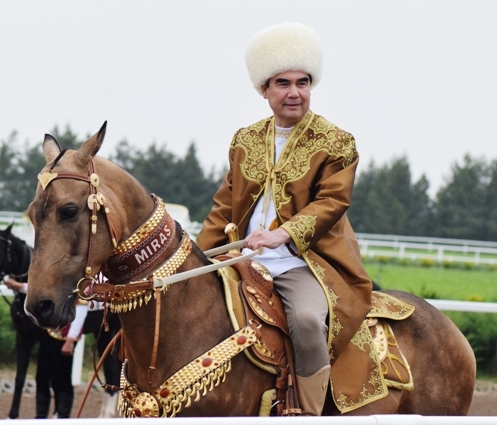 President Berdymuhamedov, who has deep love for the horse, and is an author of two books on Ahal-Teke horse, is systematically using the centuries-old bond between the Turkmen people and the horse to build a resilient nation.